Add this 30 minutes to your Morning schedule. If you join the line as a designated leader assisting the AoPPW Host please have your bible ready in some form to quickly reference and read the Word of God. Open prayer & worship - ~10 min. During the open worship time, feel free to pray as you will into the prayer meeting line, or on mute directly to the Lord. You may hear prayers and worship in English or hear people praying in a prayer language (speaking in tounges). Its ok, you don't have to understand all that is being directed to God at this point. Just flow in spirit of prayer together on the line and pray or worship in your own way. At this point we are all directing the prayer and worship to God together and He is able to understand every word! You may hear background music, please continue in prayer as you are led. Praise and Songs - ~10 min. If a song is led feel free to sing along or just flow with spirit of worship. Due to phone line delay please mute your line if you want to sing the words of the song. Specific Prayer Requests - ~10 min. 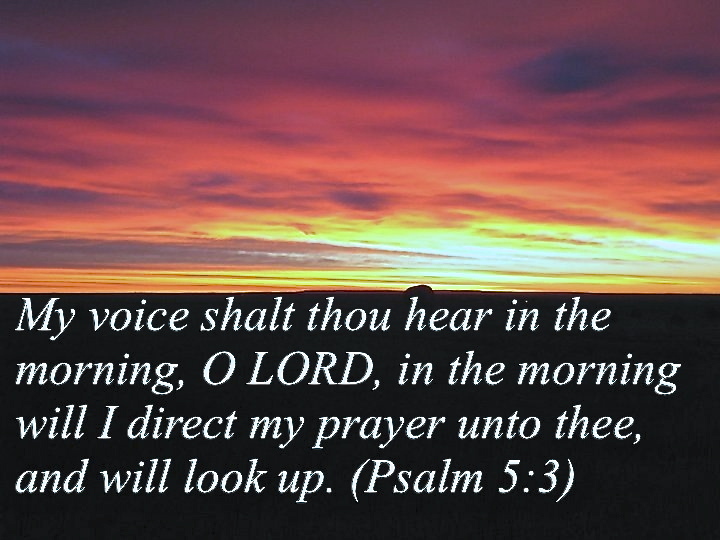 Psalms 5:3 My voice shalt thou hear in the morning, O LORD; in the morning will I direct [my prayer] unto thee, and will look up. Lamentations 3:22 [It is of] the LORD'S mercies that we are not consumed, because his compassions fail not. Lamentations 3:23 [They are] new every morning: great [is] thy faithfulness. Mar 1:35 And in the morning, rising up a great while before day, he went out, and departed into a solitary place, and there prayed. Take confidence in the Lord!